here's a re-run from the past couple of years, complete with the title change and a few edits to render the accurate passage of time. Bear with it, because this has become an annual fixture. NOTE : every word of the following story is true (or rather remembered as exactly as humanly possible given that over three decades have elapsed since it happened), and if you find some of it offensive at this late date, imagine being in my shoes at age fifteen! It was the start of my tenth grade school day morning and I was disgruntled (as usual) at being denied sleep and instead being herded along with the rest of the cattle at Westport', CT's Staples High School into yet another inane class. The first item of regurgitation/education of the morning was English with Mr. Dyskolos (not his real name; changed for reasons soon to be apparent), a late-forty-something red-headed guy who then resembled what Danny Bonaduce looks like today who was also among the minute handful of teachers whose classes would keep students awake because he was genuinely interesting, did not talk down to the kids, and had not allowed the thankless teaching system to beat him down and force him to consider his job a mocking reminder of wage-slavery (I'm the son of a teacher, so I speak with a working knowledge of such things). That was the real meat of it but the back and forth ranting went on for the class's full hour, with order barely being restored with the ringing of the bell marking the rotation to the next class. Each of my classmates and I zombied off to the next class and swiftly discovered that Mr. Dyskolos had been correct in his auguring. Indeed, each and every teacher I had to endure for the rest of the day derailed the planned curriculum in favor of rose-colored reminiscences of "a more innocent time" full of free love, "the people getting together, man! "and how the Beatles were the troubadours that saw them through all of it and changed to reflect the time. That was all well and good in theory, but not for hours on end as heard from speakers of wildly varying levels of eloquence (to say nothing of interest), with lunch being the day's only respite from what was essentially the same story only with the most minor of variations. When the day finally ended I headed downtown to do my volunteer teaching of a cartooning class at the local YMCA and the journey allowed me some time to process the events of the day and the "truths" imparted. I'd grown up liking the Beatles quite a lot but didn't own any of their albums on vinyl thanks to their many hits being available in endless rotation on some of the nascent stations that played what would come to be known as "classic rock," and as the seventies ended I avoided the agonizing repetition of disco and such by listening to the excellent oldies station WBLI out of Long Island, a radio entity that served to plant the seeds of my passion for pre-1970's rock that was either primitive and raw or bizarre and very much off the beaten path. WBLI played some of the standard Beatles hits, but they also threw stuff like "Devil in Her Heart," "Dig A Pony" and "Rain" (nowadays my favorite Beatles tune of all) into the mix and showed me just how much the classic rock stations played the same Fab Four songs over and over and over and over and over again, ad nauseum, and taking into account the espoused theory — voiced with absolute certainty of its veracity — that myself and my fellow students may have been a bunch of programmed drones, I began to wonder if Mr. Dyskolos had in fact done his young charges a favor by showing none of the rote reverence extended to the favorite sons of Liverpool by all who drew breath. He had effectively "killed our idol" on the day when one would expect nothing but 100% adherence to the party line, and that greatly intrigued my punk rock-influenced sensibilities. Later that night as I lay there in my bed staring up at the white stucco ceiling, I listened to my cassette tape of SERGEANT PEPPER'S LONELY HEARTS CLUB BAND (the only Beatles album I owned at the time) and experienced it in a way that I never had before. I'd listened to it about two dozen times since acquiring it a couple of years previous, but now it served as a poignant grave marker for my favorite member of the Beatles and its words took on a whole new timbre. 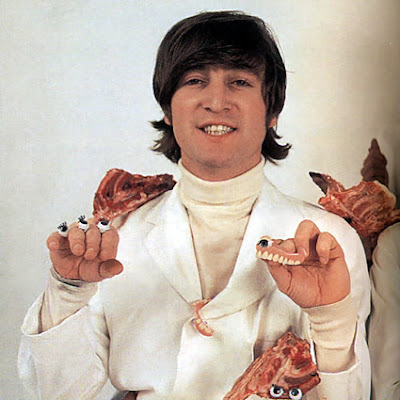 No one would be "fixing a hole" in Lennon and ensuring he would live to see sixty-four and beyond. He would not be getting better and there would be no more good mornings for him. Yet tragic though it was, this was just another day in the collective life, and that life would go on without John Lennon (though obviously not "within"). I remember the hue and cry when Elvis Presley, the so-called King of Rock 'n' Roll, gave up the ghost and people acted as though the world had come to an end, and I frankly didn't get it. I liked some of Elvis's music, but it didn't really speak to me in the way that the Beatles had and I now chalk that up to the Beatles happening during what could arguably be considered the most pivotal period of the twentieth century, a time that redefined much of American culture and into which my generation was born. We didn't grow up with Elvis, whose music helped set the template of rock 'n' roll, but we did come along during the rise of the Beatles and reached early sentience while under the influence of their sound. We couldn't know at the time just what their contribution meant, but we did know that we liked it. Obsessive poring over the minutia of the whys and wherefores of their lives, art and careers would come later. At that point in our young lives love was indeed all we needed, and in the wake of the plastic disco era and what small impact punk had in the U.S. at the time, that wasn't a bad thing. 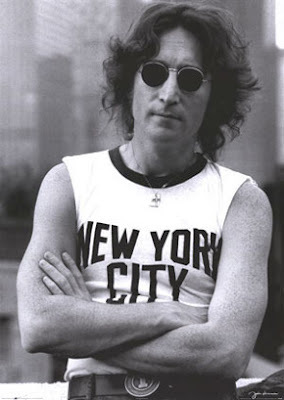 So today marks the thirty-fifth anniversary of John Lennon's senseless slaughter and for me the day that it happened becomes ever more remote, so I figured I'd jot down my experience of it before age robs it of what clarity remains. If any of you have tales of that day, please write in and share. 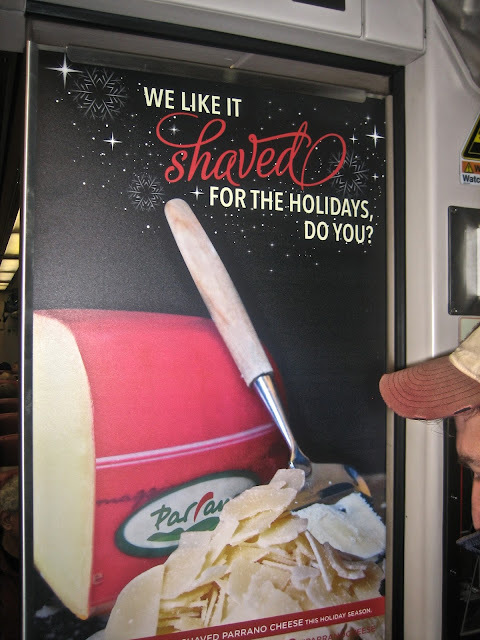 As seen on the Metro North train while returning to NYC from Thanksgiving. As Tom Lehrer once so astutely observed, "When correctly viewed, everything is lewd."